The problem of phishing is now a well-established user-facing threat, and poses a real risk to both the individuals and organisations that find themselves targeted. Unfortunately, while the threat is now well-recognized in concept, it continues to evolve in practice and can still represent a significant challenge for users to avoid. Indeed, while examples of fairly generic scams can still be found, they are accompanied by more focused attacks that can target users using more specific information. In this context, there is a clear potential for Web 2.0 to increase the risk. Not only have services such as social networks become popular targets for general phishing, they have also enabled users to expose more data, which may in turn permit more tailored attacks against them. Moreover, thanks to Web 2.0 (and beyond), users are more regularly familiar with providing and sharing their personal information online, and so must become sufficiently aware of the contexts in which they can safely release it. 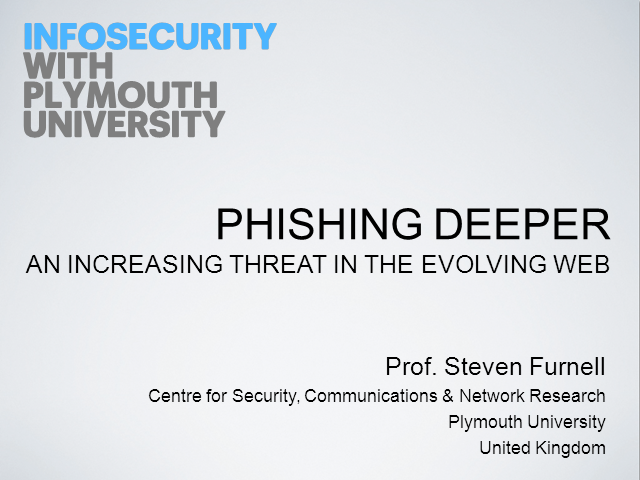 Against this backdrop, the presentation looks at the nature of the phishing threat, and considers how to safeguard users through appropriate technology and awareness raising.